If you are interested to have some exposure to the European equity market, this is a suitable ETF to go into. A dividend weighted index designed to provide exposure to European equity securities, particularly shares of European exporters, while at the same time neutralizing exposure to fluctuations between the value of the U.S. dollar and the euro. Selection criteria: At least $1 billion in market capitalization and derive at least 50% of their revenue from countries outside of Europe. Countries historically represented in the Index include: Germany, France, the Netherlands, Spain, Belgium, Finland, Italy, Portugal, Austria and Ireland. Currency hedge: The Index applies an applicable published WM/Reuters one-month currency forward rate to the total equity exposure of each country in the Index to adjust the value of the euro against the U.S. dollar. Forward currency contracts or futures contracts are used to offset the Fund’s exposure to the euro. The amount of forward contracts and futures contracts in the Fund is based on the aggregate exposure of the Fund and Index to the euro. Closely tracking Stoxx 600 index: Based on historical 5-year data, the Fund’s market price and NAV closely tracked Stoxx 600 index with correlation of 0.984 and 0.991 respectively. 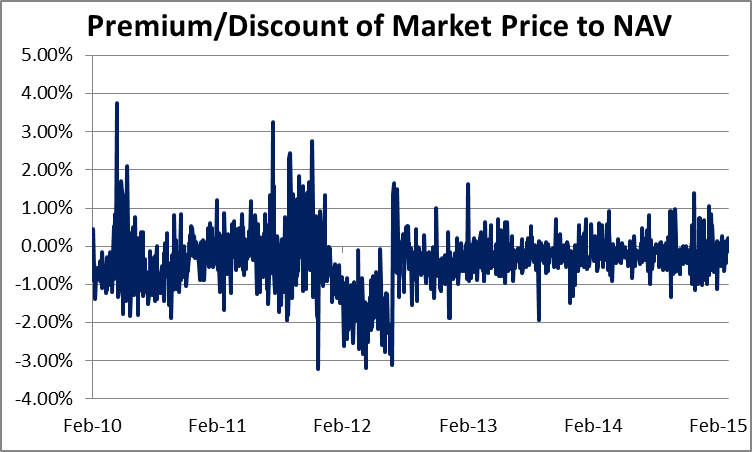 Premium/Discount of market price to NAV: Over the past 5 years, the gap between the Fund’s market price and NAV narrowed from around ±3% in 2010 to around ±1% currently. 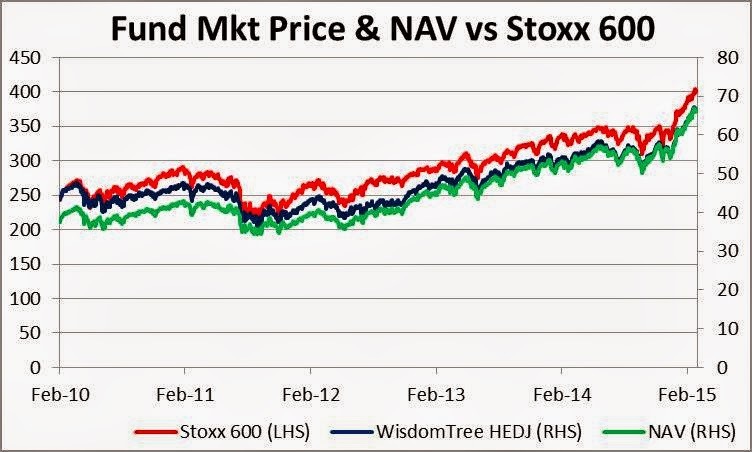 This implied that the Fund’s market price is tracking its NAV more closely. Recommendation: Around US$65 level (slightly below 20MA line) could be a good price to enter (if any correction) as price was trading at US$64.50 before 4 Mar 2015 ECB meeting. For more info on this fund, visit here. 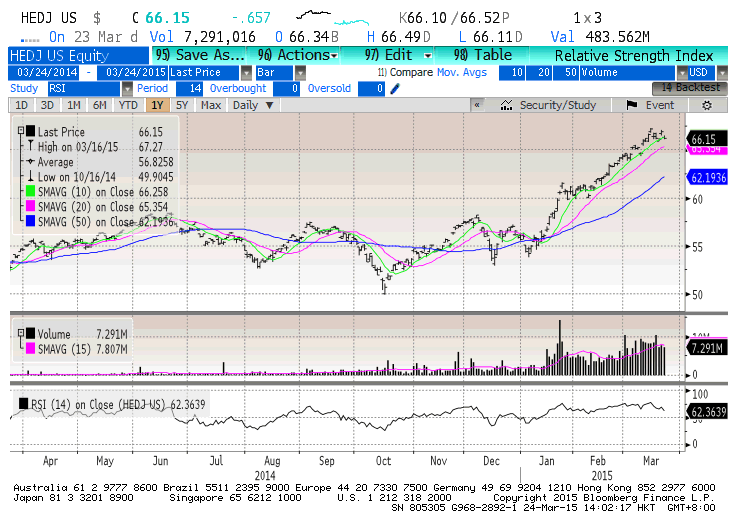 Looking fir some sort of data for KLSE stock analysis to do research in Bursa Malaysian stocks.